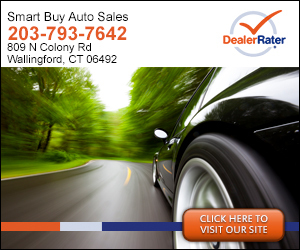 Located in Wallingford, Smart Buy Auto Sales is a pre-owned, late model dealer that provides customers with a complete automotive experience at competitive prices. Smart Buy Auto Sales is dedicated to customer satisfaction and we have provided you with a map, as well as our address and phone number to help you find us easily. We are passionate about all types of cars and we are intent on sharing that passion with you when you purchase your new car from us. Come by today and test drive the car of your choice. "A great experience, friendly and trustworthy people !!!! " I had a great experience buying from smart auto. The salesperson took his time showing me the car and no pressure at all. Friendly nice people . we have had an awesome experience. We appreciate the honesty and flexibility of Phil Barber.He was so nice and treated us like family We also appreciated how patient he was. He deserves to be recognized for all he does to make his customers feel happy, comfortable and well taken care of. Jake was also very patient and helpful.